In the past, the Iloilo-Zamboanga route was an important route. Iloilo and Zamboanga are among the top trade and commercial centers of the country for a long time already (in the Top 5 for so long now) and it only makes sense to connect the two for after all, Iloilo is the main commercial center of Western Visayas and Zamboanga is the main commercial center of Western Mindanao (talking of geographical regions and not the political-administrative regions). The links of the two are not just recent. In fact, the two centers have already been connected for over a century now starting even in the late Spanish rule when sea lanes were already safe and there was already steam power. And before World War II, foreign vessels (mainly British) from Singapore even came to the two cities to trade and bring passengers and mail, too. The route of the Manila ships going to southern Mindanao in the past goes either via Cebu or Iloilo (which is the western and most direct route). From those two ports and other ports along the way the passenger-cargo ships will then dock in Zamboanga. In the first 30 years after World War II the route via Cebu was the heavily favored one by the shipping companies. After that, the favor turned to Iloilo slowly until Cebu was practically no longer a gateway to southern Mindanao (only Sulpicio Lines did that route in the later decades through the Filipina Princess and the Princess of New Unity). Maybe the emergence of the fast cruiser liners dictated the shift to Iloilo. If they go via Iloilo, a complete voyage in less than a week’s time is guaranteed. If they go via Cebu, the fast cruiser liners then probably had to go via the eastern seaboard of Mindanao to catch up and complete the voyage in a week’s time (so that a regular weekly sailing can be maintained). But in the eastern seaboard they will miss the cargo and passenger load that is available in Zamboanga port. The small ports of Mati, Bislig or Surigao are a poor compensation for that but the fast cruiser liners might not even have the speed and time to spare to call in any of those ports. Moreover, if the ship intends to call in General Santos City (Dadiangas before), then a western route via Iloilo and Zamboanga is almost dictated. General Santos City’s combined cargo and passengers are simply to big to be left out by a liner going to Davao. After World War II, it was the Philippine Steam and Navigation Company (PSNC) and Carlos A. Go Thong & Company (the predecessor company of Gothong Lines, Sulpicio Lines and Lorenzo Shipping) which had passenger-cargo ships from Manila calling on Iloilo and Zamboanga on the way to southern ports. The former even used their best ships, the luxury liners Legazpi and Elcano on that route. Amazingly, the leader Compania Maritima and William Lines did not do the route passing through Iloilo as both preferred to do the route via Cebu to connect to Zamboanga (and Southern Mindanao). Then the situation was reversed in the 1970’s when Aboitiz Shipping Corporation, the successor of PSNC stopped that connection (as they were running out of good passenger ships) and Sulpicio Lines did the route in 1974 after the route became a casualty of the split of Carlos A. Go Thong & Company. Then in 1976, Compania Maritima followed suit and connected also Southern Mindanao via Iloilo and Zamboanga. In 1979, with the arrival of the Don Eusebio, Sulpicio Lines introduced the fast cruiser liner type between Iloilo and Zamboanga. 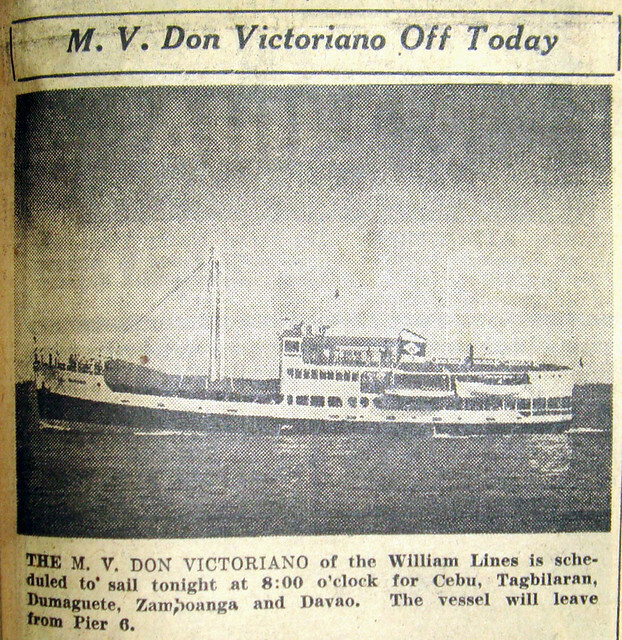 Don Eusebio, the latter Dipolog Princess had a Manila-Iloilo-Zamboanga-Cotabato route. Later her route was shifted to Manila-Iloilo-Zamboanga-Dadiangas. However, the Dona Marilyn was used to maintain the route ending in Cotabato and when the Cotabato Princess arrived in 1988, Sulpicio substituted the new RORO liner there while the Manila-Iloilo-Zamboanga-Dadiangas route was maintained by the Don Eusebio. In this period, the main rival of Sulpicio Lines which is William Lines bypassed Iloilo as did Sweet Lines, another liner company with a route to as far as Davao. In the early 1990′s, Aboitiz Shipping Corporation made a comeback in Southern Mindanao and their SuperFerry 3 which had a Manila-Iloilo-Zamboanga-Cotabato route connected Iloilo and Zamboanga. Meanwhile, Sulpicio Lines substituted their new Princess of the Pacific in the Manila-Iloilo-Zamboanga-Dadiangas route while their Cotabato Princess was kept in the route ending in Cotabato (but which is now calling also in Estancia. When WG&A was created they also connected Iloilo and Zamboanga mainly through their Manila-Iloilo-Zamboanga-Cotabato route and the trio of SuperFerry 2, SuperFerry 5 and SuperFerry 9 (which had about the same cruising speed) mainly held that route when it was still WG&A. When the company began selling liners and it became Aboitiz Transport System other ships subsequently held the route (too many to keep track really as they are fond of juggling ship assignments and they were also disposing ships and buying new ones). At one time there was also a Manila-Iloilo-Zamboanga route. It was a wonder for me why the Davao ships of WG&A and ATS don’t normally call in Zamboanga while calling in Iloilo when it is just on the way and the companies use pairing of ships so an exact weekly schedule for one ship need not be met. When Negros Navigation (Nenaco) started doing southern Mindanao routes in 1998 they also connected the two ports on their separate routes to General Santos City and Davao (the two routes was coalesced later). However, early in the new millennium Negros Navigation abandoned their Southern Mindanao routes but maintained their Manila-Bacolod-Iloilo-Zamboanga route until they had problems of ship availability. The early ships of Negros Navigation in the route were the St. Ezekiel Moreno and San Lorenzo Ruiz. However, it seems the Don Julio started the Iloilo-Zamboanga route for Negros Navigation earlier than the two. Amazingly a regional shipping line, the Trans-Asia Shipping Lines Inc. (TASLI) of Cebu also connected Iloilo and Zamboanga in 1988. This was the Asia Korea (later the Asia Hongkong and now the Reina del Rosario of Montenegro Shipping Lines) which did a Cebu-Iloilo-Zamboanga-General Santos City route (which I say was a brave and optimistic try). They were only able to maintain the route for a few years, however. In the second decade of the millennium, the successor to WG&A, the Aboitiz Transport System (ATS) dropped the routes to Davao, General Santos City and Cotabato. Suddenly the route to Zamboanga became threatened because Zamboanga port alone cannot fill 150-meter RORO liners. Not long after this ATS stopped the route to Zamboanga citing threats from the Abu Sayyaf Group (while at the same time their container ships continued sailing to Zamboanga and Southern Mindanao). It seems to me the reason they put forward was just a canard especially since 2GO still calls in Zamboanga. ATS was just losing in the Southern Mindanao route because they have the highest cargo rates in the industry and by this time the passengers were already migrating to other forms of transport like the budget airlines. It was a debacle for the route since when Aboitiz Transport System stopped sailing it Negros Navigation and Sulpicio Lines have already stopped sailing too for entirely different reasons. Negros Navigation compacted its route system and it had the problem of ship reliability and availability during their period of company rehabilitation while Sulpicio Lines was suspended from sailing in the aftermath of the Princess of the Stars sinking (and they never went back again to full passenger sailing until they quit it entirely). Negros Navigation was still sailing off and on to Zamboanga when they took over ATS. When the new route system was rolled out after the merger of Negros Navigation and ATS, amazingly the route to Zamboanga was scrubbed out. Later, the successor company 2GO went back to Zamboanga but the ship calls in Dumaguete already and not in Iloilo anymore. Until now there is no passenger ship that connects Iloilo and Zamboanga. Passengers then have to take the roundabout Ceres bus passing through Dapitan, Dumaguete and it has an endpoint in Bacolod. From there the passengers have to take a separate ferry to Iloilo or via Dumangas. The length and the many transfers means this is a really uncomfortable trip and a disservice to passengers. Maybe the liners have already forgotten they are also in public service and profitability is not the only gauge in shipping. If there is ever a connection now between the two great trading centers it is just via container ships now.